Want to hear more Voices? Visit the Voices Of The Weird archive by clicking here. 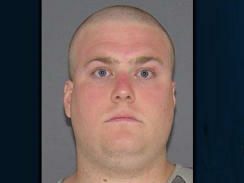 Williams is accused of throwing rocks through several of the high school’s windows. After which, he climbed through a window, entered the school, and sprayed several fire extinguishers throughout the hallways and rooms, causing damage. I know, I know: who cares what he did. Get back to the Spider-Man underwear bit, right? Well, apparently Williams isn’t talking, so police are stumped as to why this guy chose the particular outfit he did. I’m sure drugs and/or alcohol might have been a contributing factor. 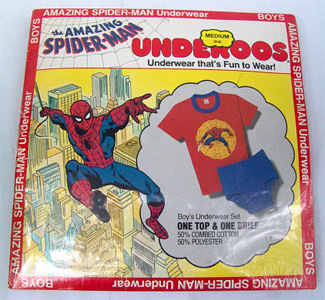 But maybe, just maybe, police mistakenly referred to it as Spider-Man underwear when in fact it was Venom underwear! That would certainly add a wrinkle, huh? There’s one other aspect of this case that has me perplexed. A CBS News article lists Williams at 6-foot-5 and 295 pounds. Funny, but I don’t remember Underoos coming in sizes that big. You can read the original Cincinnati.com article by clicking here. For some reason, I always feel the need to begin every tokoloshe-related post I write with “just when you thought it couldn’t get any weirder.” This time, a mother is refusing to bury her daughter because she believes the girl is still alive and that her spirit is being held captive by a tokoloshe. According to a report in the Daily Sun, 56-year-old Sibongile Shange has already postponed the funeral of her daughter, Zodwa Shange, twice and had left the girl’s body lying a mortuary for two weeks. Sibongile is convinced that her daughter isn’t really dead and has instead been put under some sport of spell that was placed upon her by a tokoloshe. As evidence of this, the mother points to the strange circumstances surrounding her daughter’s “death”. As the mother describes things, 25-year-old Zodwa came home from work one afternoon and then realized that she had left her uneaten lunch on the bathroom counter at her workplace. Zodwa then phoned a co-worker, explained where she had left her lunch, and asked the co-worker to retrieve the food from the rest room and bring it to Zodwa. The co-worker complied, but when she arrived at the house, she told Zodwa and her mother that the lunch had not been on the bathroom counter, but rather “hidden behind a toilet seat”. At that point, Zodwa took a bottle of mineral water from the lunch bag and drank from it. Suddenly, Zodwa reacted violently “as if something had pushed her” and then collapsed. Zodwa’s mother noticed water oozing from her daughter’s mouth and surmised that “there was something wrong” with the mineral water. Paramedics were summoned, but they were unable to revive Zodwa and pronounced her dead at the scene. That night, Zodwa’s mother and fiance both became convinced that a tokoloshe was to blame. They believed that someone cast a spell on Zodwa’s lunch, which explains why the co-worker had found it in a spot other than where Zodwa left it. Further, Zodwa’s mother claims that when the girl drank the mineral water from the lunch, it released a tokoloshe, who pushed Zodwa down before taking over her body. 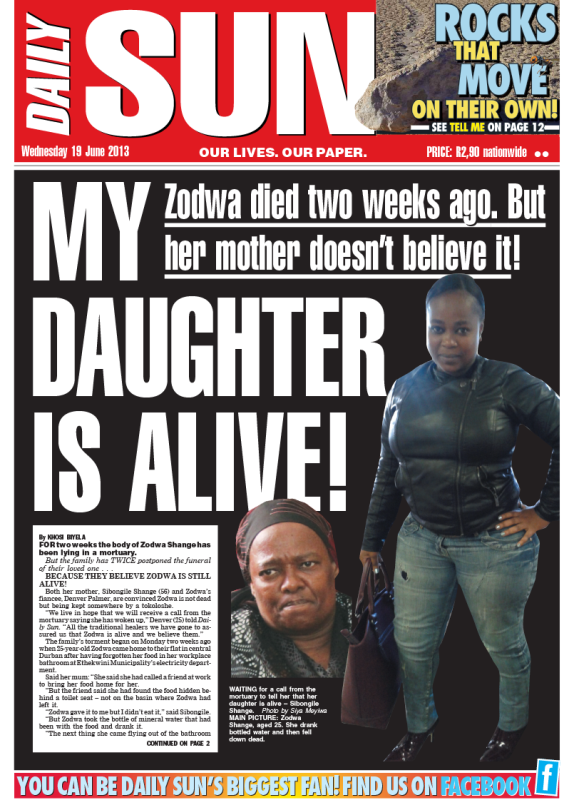 Zodwa’s family is attempting to find a way to chase off the tokoloshe, which they believe will result in Zodwa coming back to life. For that reason, they are refusing to respond to the funeral home’s pleas to bury Zodwa. So for now, the funeral home has been keeping the girl’s body locked up, but has hinted that if the family does not respond soon, they may be forced to dispose of the body themselves. You can read the entire article about this bizarre case by clicking here.